“You’re in the fairy tale now, aren’t ya?” So asks Mad Sweeney (Pablo Schreiber) in the new trailer for American Gods Season 2, and indeed we are as the second season of Starz’s sumptuous fantasy series looks to drop us in the middle of a war between gods. After Season 1 introduced audiences to Shadow Moon (Ricky Whittle), Laura Moon (Emily Browning) and Neil Gaiman’s spectacular world of god, old and new. At the top of the immortal call sheet is of course, Mr. Wednesday, aka Odin (Ian McShane), who’s rallying the old gods in a battle against the nascent power-hungry forces like Mr. World (Crispin Glover) and of course, Technical Boy (Bruce Langley). It’s been a bit of a rough journey getting to the second season of American Gods. The series was expected to return for Season 2 this year after wrapping up its first season in 2017, but original showrunners Michael Green and Bryan Fuller departed after conflicts with the network over budgetary issues. A few months later, Jesse Alexander and author Neil Gaiman stepped into the role of co-showrunners, only for Alexander to be sidelined last month amid production delays. The second season of the series is now expected to launch sometime in 2019 on Starz, nearly two years after the first season went off the air. 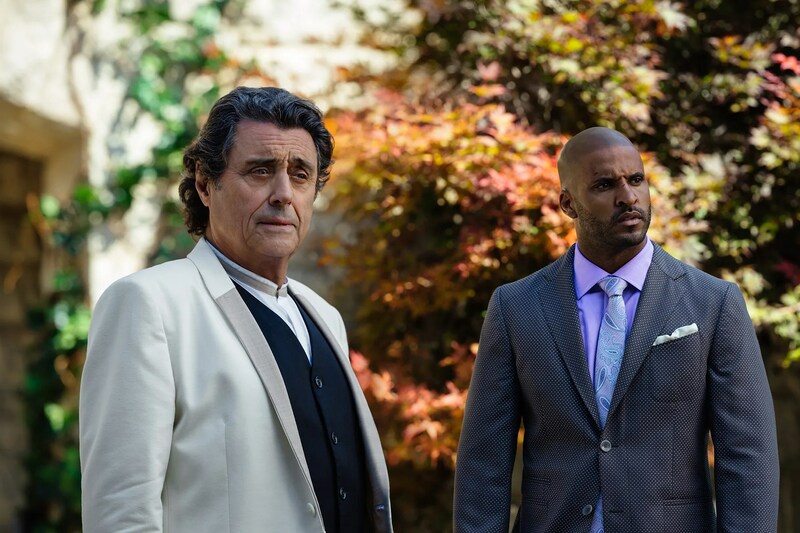 What’s clear from the teaser is that, even amid all the shakeups and production issues, the network still intends to put a premium on the visuals in American Gods… and watching Ian McShane chew his fantastical scenery is still just as fun as ever. As you might expect considering the circumstances, details on Season 2 are still pretty tightly under wraps, though the folks at NYCC learned that the second season wil pick up only a matter of hours after the events of the first season and will not make it to Lakeside. It’s will make it to Cairo and the funeral parlor, and introduce us to some older (and perhaps more book-accurate) versions of Technology Boy throughout the evolution of technology. For now, see what you can glimpse in the Season 2 teaser trailer below, and stay tuned for more as the series return draws near.